The Blot finally saw Ant-Man and The Wasp yesterday, so what better time to post about the second series of Ant-Man and The Wasp Pop! vinyl figures by Funko! What’s awesome about Ant-Man and The Wasp Series 2 is that it focuses on the original diminutive super heroes, Hank Pym and Janet van Dyne. 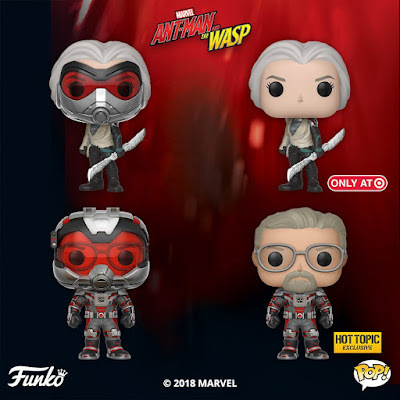 Ant-Man and The Wasp Pop! Series 2 features scientist and former S.H.I.E.L.D. member Hank Pym in his full uniform including mask, while Janet van Dyne, the original Wasp, is available in her full uniform including mask. There’s also a Hot Topic unmasked Hank Pym and a Target Exclusive Unmasked Janet van Dyne. Each Ant-Man and The Wasp Pop! Marvel Vinyl Figure stands 3.75” tall, has a rotating head and comes in a displayable window box. Collectors can pre-order these awesome new Marvel Cinematic Universe figures now at Entertainment Earth for $10.99 each here.